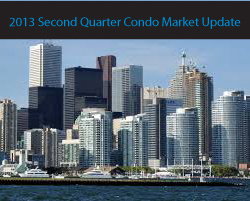 GTA condo sales were down by 6% in the second quarter of 2013 compared to the same period last year. The number of active listings at the end of the second quarter was up year-over-year by less than 2.5%, while new listings were down just over 4%. In the City of Toronto it was a similar story with sales down 4.6% over last year. “The GTA condominium apartment market has been the subject of much discussion due in large part to the number of new units completed over the past two years and the number of units that remain under construction. With this in mind, it is important to point out that the condo market has fared quite well. Even with sales down and the number of active listings up, the average selling price has found support at current levels,” said Toronto Real Estate Board President Dianne Usher. The average selling price in the GTA for condominium apartments in the second quarter was $347,896 – up by 1.7% compared to the average of $342,148 during the same period last year. In the City of Toronto specifically, the average selling price was $372,805, an increase of 2.3%. C01: $423,324, C08: $416,908, E01: 433,632, E02: 465,867, W01: $389,106, W02: 380,994.